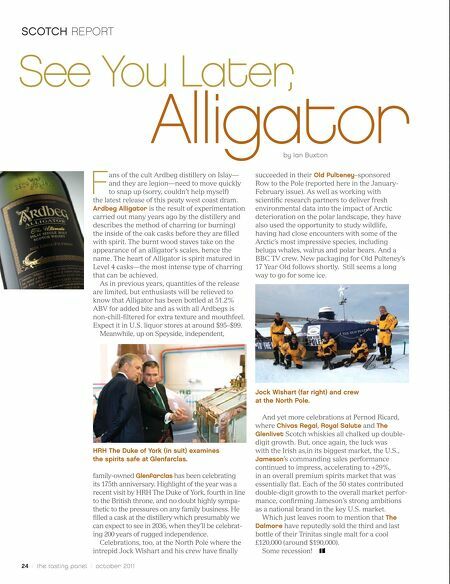 SCOTCH REPORT See You Later, Alligator by Ian Buxton F ans of the cult Ardbeg distillery on Islay— and they are legion—need to move quickly to snap up (sorry, couldn't help myself) the latest release of this peaty west coast dram. Ardbeg Alligator is the result of experimentation carried out many years ago by the distillery and describes the method of charring (or burning) the inside of the oak casks before they are filled with spirit. The burnt wood staves take on the appearance of an alligator's scales, hence the name. The heart of Alligator is spirit matured in Level 4 casks—the most intense type of charring that can be achieved. As in previous years, quantities of the release are limited, but enthusiasts will be relieved to know that Alligator has been bottled at 51.2% ABV for added bite and as with all Ardbegs is non-chill-filtered for extra texture and mouthfeel. Expect it in U.S. liquor stores at around $95–$99. 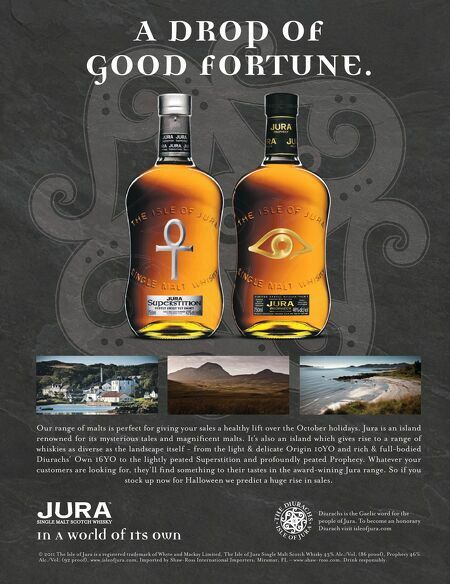 Meanwhile, up on Speyside, independent, succeeded in their Old Pulteney–sponsored Row to the Pole (reported here in the January- February issue). As well as working with scientific research partners to deliver fresh environmental data into the impact of Arctic deterioration on the polar landscape, they have also used the opportunity to study wildlife, having had close encounters with some of the Arctic's most impressive species, including beluga whales, walrus and polar bears. And a BBC TV crew. New packaging for Old Pulteney's 17 Year Old follows shortly. Still seems a long way to go for some ice. Jock Wishart (far right) and crew at the North Pole. And yet more celebrations at Pernod Ricard, HRH The Duke of York (in suit) examines the spirits safe at Glenfarclas. family-owned Glenfarclas has been celebrating its 175th anniversary. Highlight of the year was a recent visit by HRH The Duke of York, fourth in line to the British throne, and no doubt highly sympa- thetic to the pressures on any family business. He filled a cask at the distillery which presumably we can expect to see in 2036, when they'll be celebrat- ing 200 years of rugged independence. Celebrations, too, at the North Pole where the intrepid Jock Wishart and his crew have finally 24 / the tasting panel / october 2011 where Chivas Regal, Royal Salute and The Glenlivet Scotch whiskies all chalked up double- digit growth. But, once again, the luck was with the Irish as,in its biggest market, the U.S., Jameson's commanding sales performance continued to impress, accelerating to +29%, in an overall premium spirits market that was essentially flat. Each of the 50 states contributed double-digit growth to the overall market perfor- mance, confirming Jameson's strong ambitions as a national brand in the key U.S. market. Which just leaves room to mention that The Dalmore have reputedly sold the third and last bottle of their Trinitas single malt for a cool £120,000 (around $190,000). Some recession!